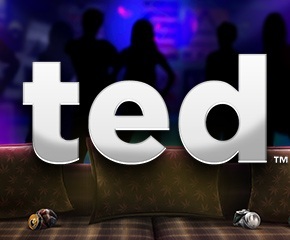 Ted is a popular R-rated comedy movie of 2012 and is also the top grossing movie of that year in the category. It is based on exactly on that hilarious movie and features various characters of the movie too. There are five reels and twenty paylines that are active all the time during the game. The reels are placed over the background view of a living room where the bear is seen leaning against a table. There is music from the soundtrack of the movie that makes the game more entertaining. The wagering here begins with £0.20 and maximum is set at £400 a spin. This wonderful new movie-themed slot game was developed by Blueprint Gaming. One of the leading online casino games developers in the world with the vast experience of over ten years. All their games are unique in experience and are playable on various mobile and tablets as well. 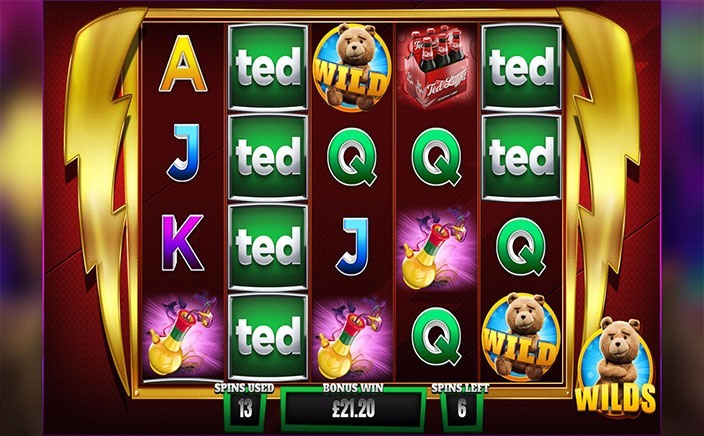 The symbols of Ted slots are taken originally from the movie to make the game look more relevant. There are cola bottles, a psychedelic vase, a goose, beautiful girl and finally the game logo. This is also the highest paying symbol with 500 times your stake. The logo can appear fully stacked on the reels to help you win big too. Card symbols from Jack to Ace pay you from 50x to 100x on five of their kind on the reels. The bear and the thunder buddies logo are the symbols that trigger the bonus features of the game. Wild Feature: The bear symbol is the wild of this game and it substitutes all except the thunder buddies symbol. Five wilds on a payline also give you a stake win of 500x and help you create multiple win combinations as well. Scatter Bonus: The Thunder buddies logo is the symbol that helps you trigger bonus features of the game. When three or more appearance occurs, you are awarded any one of five features. There are money bonus, free spins, wheels of fartune, bar crawl and flash spins that you can win from. Ted Surprise: Apart from above features, the bear randomly appears in front of the reels to offer more surprises. They include special wilds, colossal spins, super spin, tv streak, bonus boost and beer shuffle. This game is the best movie themed slot with funny animation effects and plenty of high rewarding features. The RTP of this game is 95.80%.